Urbanization is a global phenomenon, but the rate of urban growth is relatively faster in developing countries like India. The drastic urban growth in India has resulted in a huge loss of agricultural land and water bodies, which needs to be quantified for future planning and development. In this context, the present study depicts a combined approach of remote sensing and GIS techniques for delineating the land use/land cover dynamics of Salem district of Tamil Nadu in South India. 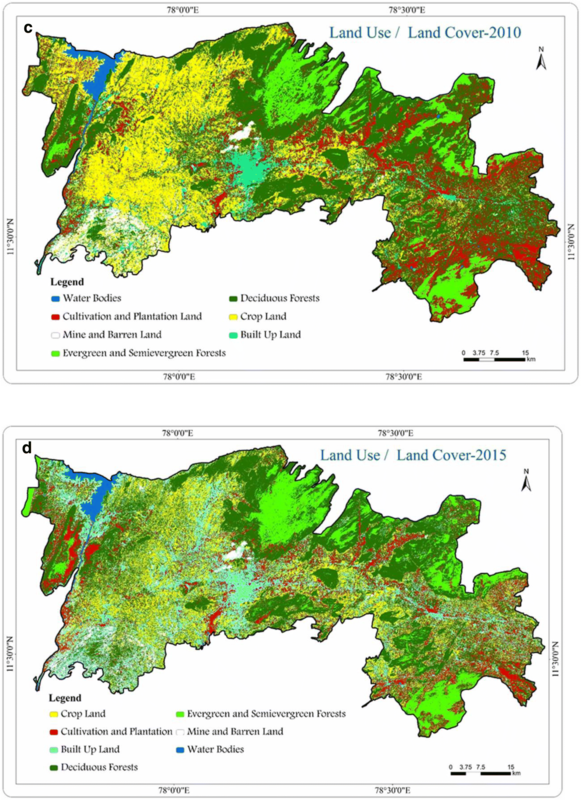 The Landsat Thematic Mapper data of the years 1992, 2001 and 2010 and Operational Land Imager data of the year 2015 were used to assess the changes in the land use and land cover. The supervised classification technique-maximum likelihood algorithm, was used in this study to classify the remote sensing data. The results indicate that the deciduous forests, croplands, cultivation and plantation lands and water bodies have decreased from 1992 to 2015 by about 398 km2, 250 km2, 45 km2 and 16 km2, respectively. At the same time, evergreen and semi-evergreen forests, built-up lands and mines and barren lands have increased by about 288 km2, 293 km2 and 128 km2, respectively. The accuracy of the present study has been assessed by using error matrix method. The overall accuracy of the land use/land cover classification of the years 1992, 2001, 2010 and 2015 is about 88%, 95%, 93% and 93%, respectively. The study showed that the combination of remote sensing and GIS is an efficient tool to detect the changes in land use/land cover. The land use/land cover information thus obtained can be used to the decision-makers for effective land use planning and management. Land use/land cover change is a fundamental anxiety in worldwide environmental changes and sustainable development. Human and natural interventions in the environment such as global warming, deforestation, land degradation, urban sprawl and natural disasters are the foremost ancestries of land use/land cover (LULC) changes [1, 2, 3]. The changes in the LULC and associated problems are often related to population growth and increased demand for socio-economic activities which create a pressure on global environmental changes. LULC study is essential for monitoring, evaluating and protecting the natural resources and useful for urban planning and developmental activities [4, 5]. Urban growth plays a vital role in many parts of the world in terms of daily quality-of-life issues, climate, ecological processes, land transformations and material flow, which can be monitored with the help of change detection analysis [4, 6, 7, 8, 9, 10, 11]. For decision-making and administration, rapid and precise information on existing LULC is required for socio-economic development of any area. The pioneering works have observed the conversion of the land cover into agricultural land and urban areas and agricultural land into urban areas which are destructive to various ecosystem facilities [12, 13, 14]. A study recognized that urban sprawl is one of the main issues that reduce the inadequate highly fertile land . Another study reveals that the LULC changes resulted in the land surface temperature increases . In the past several years, the study of LULC change is a worldwide initiative and has gained great motivation and its efforts to understand the triggering factors of LULC change. These initiatives have enthused curiosity of the researchers to apply various tools and techniques to detect and further model ecological dynamics at the different level. Change detection analysis of LULC has developed potentially, which serves the process and information in managing and monitoring by yearly, monthly and daily . An end number of techniques are available to provide rapid change detection and also compute the change attribute table. In this state, the conventional methods of LULC survey and mapping techniques cannot produce rapid and cost-effective information for timely decision-making. The remote sensing and GIS techniques are rapid and cost-effective for spatial data processing, especially in LULC monitoring process [16, 17, 18, 19, 20]. The recent studies carried out by researchers around the world concentrated on the application of remote sensing and GIS for LULC study because of their accurate georeferencing procedures and repetitive data acquisition [12, 18, 21, 22, 23, 24]. Several procedures have been developed and applied for monitoring the changes in LULC by making the use of remotely sensed data, for instance, image differencing, pixel- and object-based classification in land cover change mapping , cross-correlation analysis , comparison of spectral indices and principal component analysis , post-classification comparison  and image fusion-based land cover change detection . Change detection analysis is widely used for demarcation of LULC changes based on multi-temporal remotely sensed data. The multi-temporal and multi-spectral satellite data offer a great potential to monitor differences in LULC patterns, and the examples are IRS Resource-sat LISS III [5, 28], Landsat Multi-spectral Scanner (MSS), Thematic Mapper (TM), Enhanced Thematic Mapper Plus (ETM+) and Operational Land Imager (OLI) data which have been widely used in studies towards the determination of land cover since 1972 [8, 24]. Studies have also used MODIS sensor satellite imagery for change detection analysis [13, 27, 29]. In this context, the present study was carried out to delineate the LULC changes in Salem district, Tamil Nadu, South India, using the application of remote sensing and GIS and multi-temporal/multi-spectral satellite imageries. Salem is stressed in terms of rapid population growth, unplanned developmental activities and lack of infrastructure facilities. The aim of the study is to produce a LULC map for 1992, 2001, 2010 and 2015 and delineate the changes. The outcome of study is expected to assist the decision-makers for effective and sustainable development plans in the context of ever increasing population and global climate change. Salem district is located in Tamil Nadu state, South India (Fig. 1). Geographically, it lies between 11°10′ and 12°10′N latitudes and 77°35′ and 78°55′E longitudes. The study area is considered as the largest district in Tamil Nadu and covers an area of 5232 km2. The boundaries of the study area are marked by isolated hills, Nagaramalai in northern part, Jarugumalai in southern part, Kanjamalai in western part, Godumalai in eastern part, Shevaroy in NE part and Kariyaperumal hill ranges in south-western part. Sarabanga, Thirumanimuthar, Sweta and Vasista are the main river systems in the Salem district. The major river in South India, Cauvery, passes through the study area and supplies water for domestic and agricultural purposes of the district. The Sarabanga and Thirumanimuthar are the tributaries of Cauvery River. Massive mineral deposits such as magnetite, magnesite, bauxite, limestone and soapstone are present in Salem district. The study area is one of the fast developing cities because of favourable climate and plenty of natural resources. According to census data, the population in 2001 was 30.16 lakhs and that in 2011 was 34.82 lakhs, which indicate the rapid rate of urbanization in the study area. A combination of remote sensing and GIS techniques was applied to delineate the LULC changes in the Salem district. LULC change detection analysis was performed by a series of processes such as data acquisition, data pre-processing, supervised classification, accuracy assessment and change detection analysis [23, 30]. The present study was carried out by remote sensing data and ancillary data. The remote sensing data were obtained from the USGS-Earth Explorer. ERDAS imagine 9.2 and ArcGIS 10.2 have been used for pre-processing the remote sensing data, interpreting the imageries and data management. The ground-truth observations were used to validate the LULC classification and assess the accuracy of the classified image. The ground-truth locations were captured by geographical position system (GPS). The prepared LULC maps were statistically analysed to calculate the land use/land cover changes of the study area. LANDSAT-TM (30 m spatial resolution) data were collected for 3 years (1992, 2001 and 2010). Landsat-8 OLI (30 m spatial resolution) data were obtained for 2015. The metadata of the satellite data are given in Table 1. LANDSAT data are pre-georeferenced with the projection of UTM zone 44 N using WGS-84 datum. The necessary pre-processing methods such as calibration and removal of data dropouts were carried out using ERDAS Imagine 9.2. The selected scenes were stratified into ‘zones’ where land use/land cover types within a zone have similar spectral properties . Histogram equalization techniques were performed on each scene to enhance the data . Figure 2 shows the flow chart of the methodology used in the present study. 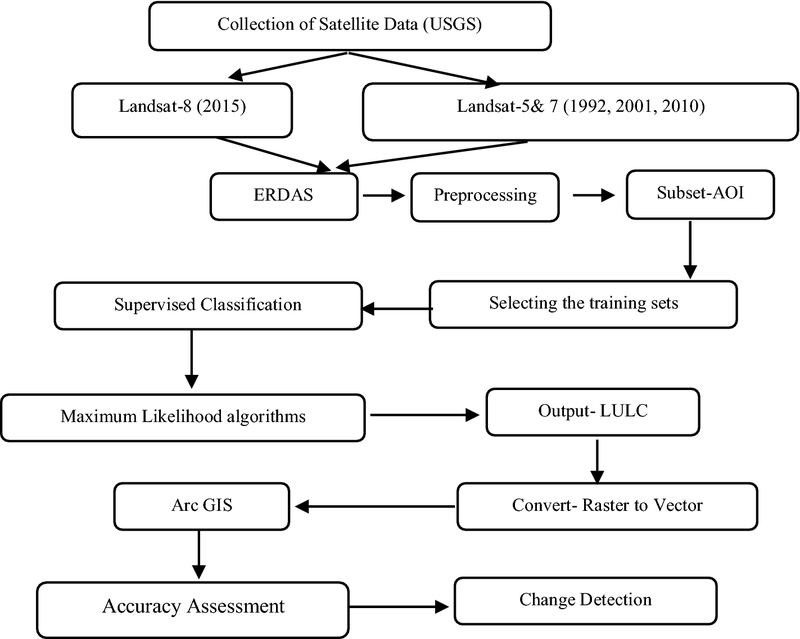 Supervised classification—maximum likelihood algorithm, was performed to classify the LULC by developed training sets on remote sensing data with the help of field observations. The final raster output was converted into vector format using ERDAS imagine 9.2. The vector output has taken into ArcGIS 10.2 platform for statistical analysis and map preparation. Therefore, the output offers LULC maps of different time series of the study area. The accuracy of the LULC classification was assessed for the classified image of 1992, 2001, 2010 and 2015. The accuracy assessment was performed by ground-truth observations collected using random method which is based on different land use/land cover classes of the study area. The accuracy was assessed by using 50 points of each land use/land cover classes based on ground-truth observations and visual interpretation techniques. The error matrix method was performed to compare the classification results with reference points. The kappa coefficient was also performed to evaluate the classification accuracy. The independent validation has been achieved for each land use/land cover map to estimate the consistency of the result. For this analysis, the accuracy assessment data were collected from remote sensing data of 1992, 2001 and 2010. Ground-truth verification was done for the year 2015. However, the 2015 ground-truth verification locations are plotted on the 1992, 2001 and 2010 remote sensing images. Based on the ground-truth verification locations, the landscape feature was absorbed by visual interpretation techniques and converted as verification locations. The accuracy of 1992, 2001 and 2010 was assessed based on verification locations on the remote sensing data. The accuracy of 2015 was assessed by ground-truth observations. Change detection analysis describes and quantifies the difference between images of the same area at different periods . This type of analysis is very much helpful to identify the various changes in land use/land cover, such as an increase in built-up land and a decrease in agricultural land . In this study, change detection statistics was calculated between the years 1992–2001, 2001–2010, 2010–2015 and 1992–2015. The derivative results from the multi-temporal remote sensing data are given in Fig. 3a–d. 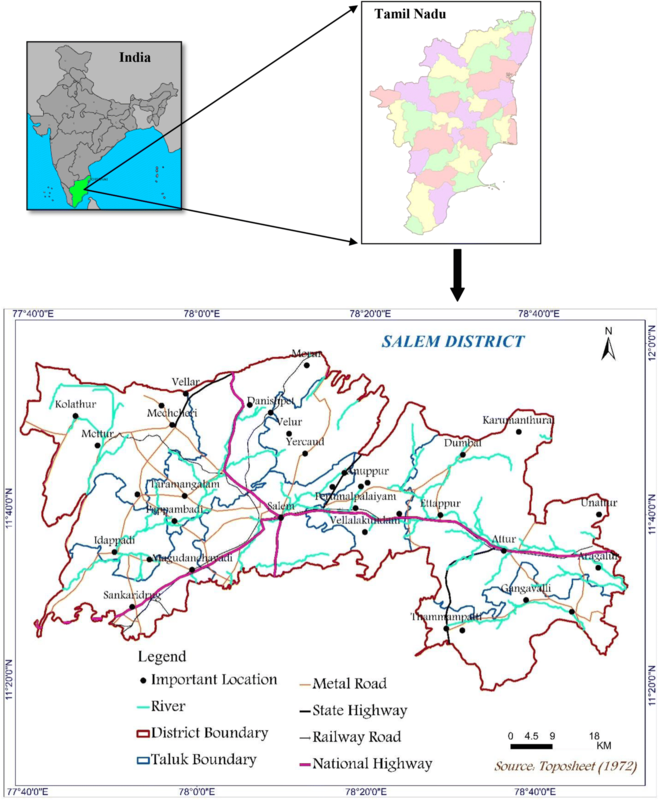 These images illustrate the status of LULC for four study periods (1992, 2001, 2010 and 2015) of the Salem district. The land use/land cover pattern of the study area is categorized into seven classes such as deciduous forest, evergreen and semi-evergreen forests, crop land, cultivation and plantation land, built-up land, water bodies, mines and barren land. These ultimate LULC classifications deliver an impression of the major land use/land cover features of the study area. Figure 2a and Table 2 reveal the areal expansion and scenario of the year 1992, about 53% (2771 km2) of the area under deciduous forest, 21% (1110 km2) of the area under crop land, 12% (637 km2) of the area under cultivation and plantation land, 6% (296 km2) of the area under evergreen and semi-evergreen forest, 4% (209 km2) of the area under built-up land, 2% (122 km2) of the area under mines and barren lands and 2% (87 km2) of the area under water bodies. Figure 2b and Table 2 represent the areal expansion and scenario of the year 2001, about 51% (2647 km2) of area under deciduous forest, 20% (1054) of the area under crop land, 13% (657 km2) of the area under cultivation and plantation land, 7% (378 km2) of the area under evergreen and semi-evergreen forest, 5% (248 km2) of the area under built-up land, 3% (164 km2) of the area under mines and barren lands and 2% (84 km2) of the area under water bodies. Figure 2c and Table 2 illustrate the areal expansion and scenario of the year 2010, about 46% (2405) of the area under deciduous forest, 19% (998) of the area under crop land, 13% (672 km2) of the area under cultivation and plantation land, 9% (496 km2) of the area under evergreen and semi-evergreen forest, 7% (362 km2) of the area under built-up land, 4% (221 km2) of the area under mines and barren lands and 1% (78 km2) of the area under water bodies. Figure 2d and Table 2 illustrate the areal expansion and scenario of the year 2015, about 45% (2373) of the area under deciduous forest, 16% (860) of the area under crop land, 11% (592 km2) of the area under cultivation and plantation land, 11% (584 km2) of the area under evergreen and semi-evergreen forest, 10% (502 km2) of the area under built-up land, 5% (250 km2) of the area under mines and barren lands and 1% (71 km2) of the area under water bodies. The study area was mostly covered with deciduous forests in 1992, 2001, 2010 and 2015. Characteristically, the forests lands play an important role in the hydrological process by infiltration of water and reducing both surface run-off and soil erosion . But the deciduous forest shows a decreasing trend from 1992 to 2015. The second dominant land cover in the study area was crop land in 1992. After 1992, a considerable amount of crop land was found to be decreased between 2001 and 2015. The declination of crop land can be mainly attributed to its diversion for non-agricultural uses and water-related issues . The cultivation and plantation land illustrates the rising trend from 1992 to 2010 and decrease in 2015. Evergreen and semi-evergreen forests denote the increasing trend from 1992 to 2015. Under the area of built-up land shows the increasing trend from 1992 to 2015. The agricultural land loss and built-up land growth show positive correlation of population growth in the study area. Accuracy assessment is essential for LULC change detection analysis . 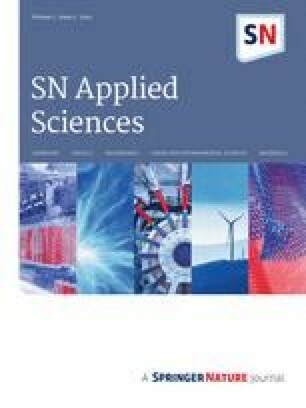 In this study, accuracy assessment of LULC classification was analysed by error matrix method [12, 23]. The comparison of classification results with reference data was made for each land use/land cover classification using error matrices. In this error matrix method, the column of the table represents the categories that are derived from the classified image. The row of the table represents the categories that are derived from the reference value. Totally, 50 reference points were collected at each class of land use/land cover pattern in the field. Producer’s accuracy, user’s accuracy, overall accuracy and kappa statistics were calculated from the error matrix method. Tables 3, 4, 5 and 6 illustrate the results of accuracy assessment of 1992, 2001, 2010 and 2015, respectively. The results of accuracy assessment revealed that the overall accuracy of LULC classification of 1992 is 88%, 2001 is 95%, 2010 is 93% and 2015 is 93%. The kappa accuracy of the LULC classification of 1992, 2001, 2010 and 2015 is found to be 86%, 9%5, 92% and 92%, respectively. Figure 4 shows the ground-truth verification of LULC. The accuracy of LULC classification was turned out to be better than anticipated. Change detection between 1992–2001, 2001–2010, 2010–2015 and 1992–2015 was obtained and is presented in Table 7, which reveals that both a decrease and an increase in LULC changes appeared in the Salem district. Between 1992 and 2001, a major decline was observed in deciduous forests by 124 km2 (− 2.37%), crop land by 56 km2 (− 1.07%) and water bodies by 3 km2 (− 0.05%), whereas a major increase in evergreen and semi-evergreen forests by 82 km2 (+ 1.56%), cultivation and plantation land by 20 km2 (+ 0.38%), built-up lands by 39 km2 (+ 0.74%) and mines and barren lands by 42 km2 (+ 0.8%). Between 2001 and 2010, a major shrink was observed in deciduous forests by 242 km2 (− 4.6%), crop lands by 56 km2 (− 1.07%) and water bodies by 6 km2 (− 0.11%), whereas areas of evergreen and semi-evergreen forests increased by 118 km2 (+ 2.25%), cultivation and plantation lands increased by 15 km2 (+ 0.28%), built-up lands increased by 114 km2 (+ 2.17%) and mines and barren lands increased by 57 km2 (+ 1.08%). Between 2010 and 2015, a major decline was noticed in deciduous forests by 32 km2 (− 0.6%), crop lands by 138 km2 (− 2.6%) and water bodies by 7 km2 (− 0.1%), whereas evergreen and semi-evergreen forests increased by 88 km2 (+ 1.7%), cultivation and plantation lands increased by 80 km2 (− 3.2%), built-up lands increased by 140 km2 (+ 2.7%) and mines and barren lands increased by 29 km2 (+ 0.8%). Between 1992 and 2015, over a period of 23 years the LULC change was observed in deciduous forests decreased by 398 km2 (− 8%), crop lands decreased by 250 km2 (− 5%), water bodies decreased by 16 km2 (− 0%), evergreen and semi-evergreen forests increased by 288 km2 (+ 6%), cultivation and plantation lands decreased by 45 km2 (− 3%), built-up lands increased by 293 km2 (+ 6%) and mines and barren lands increased by 128 km2 (+ 2%). LULC changes in Salem district are driven by a combination of natural and anthropogenic factors. Although the population growth is the main reason for built-up land growth, the influence of other factors such as environmental and socio-economic influences needs to be assessed. Environmental issues are associated with urbanisation in both developing and developed countries ; for example, the census data indicated that the population growth is high in the study area from 2001 to 2011. The urban area population growth is mainly due to migration of rural to urban areas. This increased the pressure on the natural resource and expressively promoted the built-up land expansion on agricultural lands. The economic developmental activity such as mineral exploration is the main reason for increasing the area under mines and barren lands. The present study is carried out in one of the fast developing districts of Tamil Nadu state in South India. 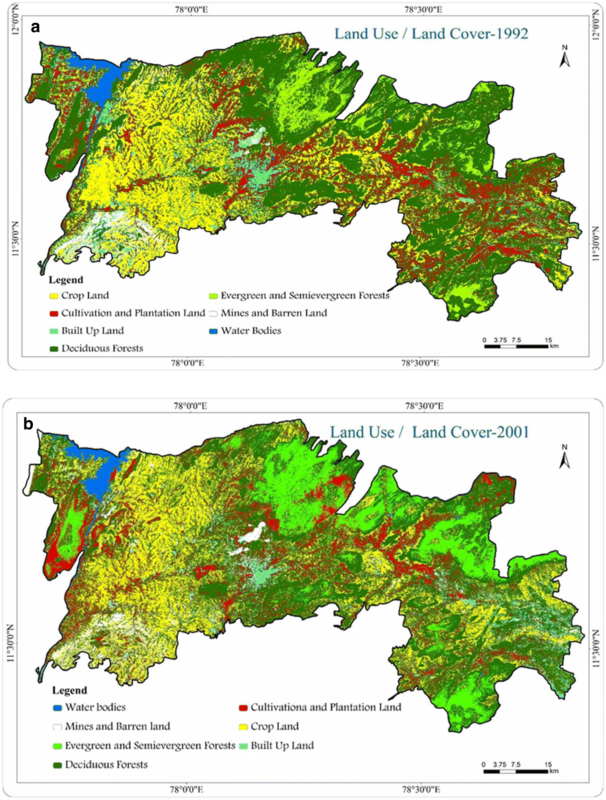 The land use/land cover dynamics of the study area was analysed by multi-temporal satellite data using remote sensing and GIS techniques. 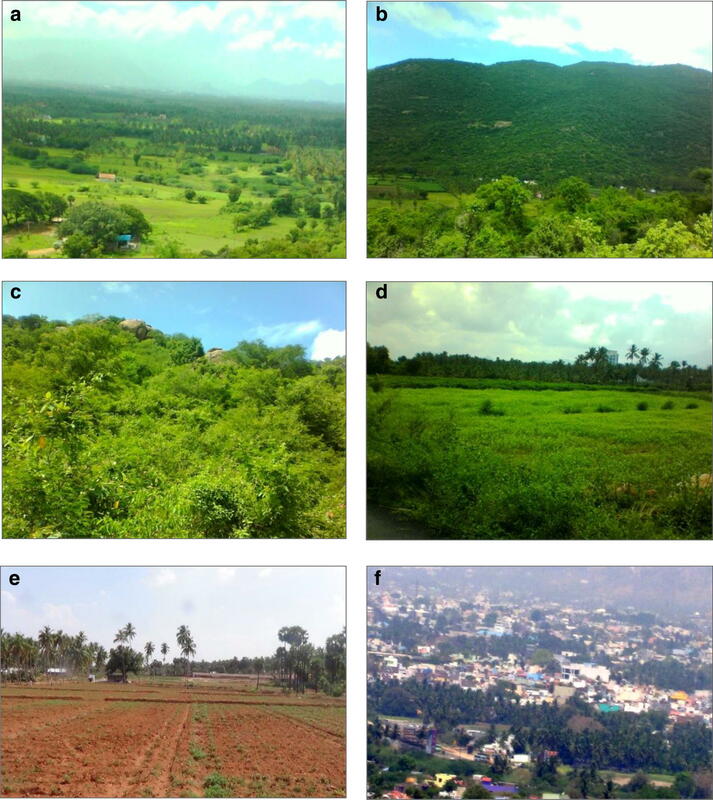 This study depicts that the major land cover in Salem district is deciduous forests and land use is agricultural land (crop land and cultivation and plantation land). During the period 1992–2015, the area under evergreen and semi-evergreen forests, mines and barren land and built-up lands has increased. At the same time, the area under deciduous forests, agricultural lands and water bodies showed an opposite trend. This shows that the agricultural lands are affected due to the development of commercial and infrastructural centres. The built-up area is also expanded which is essentially at the cost of agricultural lands adjoining townships. The deciduous forests are adversely affected due to deforestation and climate change. The ground-truth verification evidenced that the major driving forces of built-up land expansion are population growth and rapid economic development. The methodology adopted herein demonstrates the ability of remote sensing and GIS in the change detection analysis of land use/land cover of a given area. The results of the study could be used for decision-makers in the administration and planning sectors for effective and sustainable management. The author thanks Dr. B. Gurugnanam, Centre for Applied Geology, Gandhigram Rural Institute-Deemed University, Dindigul, Tamil Nadu, India, for providing supports and laboratory facilities to complete the work. The author also thanks Dr. D. Padmalal, Scientist G, National Centre for Earth Science Studies, Trivandrum, for continuous supports and encouragement. The author thanks the reviewers for critical comments and suggestions for improving the quality of the paper.